"Shiny Silvery Things positively rings with brightness and charm in a jewel encrusted trinket box full of delightful vignettes and new-found-sounds. There are so many standout tracks that it seems pointless to try to separate them in a spurious order of merit, so I won’t try. The album’s opener, Second-hand Clothes sets the tone for a string of pop pearls that are perfectly rounded and flawlessly shaped. It sets the bar high in terms of craftsmanship, and makes it clear from the outset that no detail is unimportant for O’ Caoimh. The patch pocket poetry of the lyric is stitched to the kind of bespoke melody that, like an old raincoat, will never let you down. Somehow, Cormac O’ Caoimh manages to go on from there with one great song idea after another, and rarely takes a wrong turn into makeweight diversions. Cormac O’ Caoimh has always had access to a deep well of inspiration, but if he’s thrown a few coins in for luck then his investment has grown exponentially. The sophisticated Silence and Sound, the swamp blues of In The Hollow of an Oak and the insistent Proud are highly differentiated in terms of source and style, but they knit comfortably together on a carefully planned out set of songs. If O’ Caoimh has rich threads to work with then that is largely down to knowledge, experience and a lifelong love of the kind of pop music that soundtracks our formative years. Yet, for all that, it’s his versatile and heartfelt vocal expression that brings out the meaning in full of songs like Hey You, Tea in My Teacup and Lampshade Lights. These titles may smack of whimsy, but don’t be fooled. They are rich, rewarding exemplars of mature, observational songwriting, as though The Smiths had actually grown up and become responsible adults. They say that you have to sing it like you mean it, but Cormac O’ Caoimh is such a genuine pop humanist that I don’t think that he could sing any other way, even if he tried. Shiny Silvery Things is a love letter to the author’s own musical past, made in the full knowledge that his next song might be his best work….and the song after that, and the song after that. "The fourth solo outing for singer songwriter O Caoimh continues where his previous efforts left off. This is a collection songs that belie their often ‘lightweight’ production with hidden depths or lyrical touches that make the listener sit up and take notice. On the back of the wave of positivity concerning his last release not least from this very website (‘this album is a tour de force’) O Caoimh has his work cut out – not many artists have more than one tour de force in their careers. This reviewer can but think of a couple, if that. The McAloon comparisons still bear repeating particularly on Second Hand Clothes where the vocal stylings are very similar but also and perhaps more importantly on Hey You wherein it is less the vocal style but more the quality and structure of the songwriting. A delightful song that worms its way into the ear. Perhaps with a hint of the Colourfield too. Born has an elegiac quality but the songwriting may be indebted to Mark E Everett in its repeated phrasing, whereas Have You Built Yourself Well has a Hothouse Flowers vibe; melancholy and joyous, at once catchy and thoughtful. The album continues, always putting vocals front and centre over some deft instrumentation and the quality of songwriting. Is the title track the breakout song that lifts O Caoimh out of the shadows and into the mainstream? Probably not. Too idiosyncratic but one of his songs will. One day very soon. 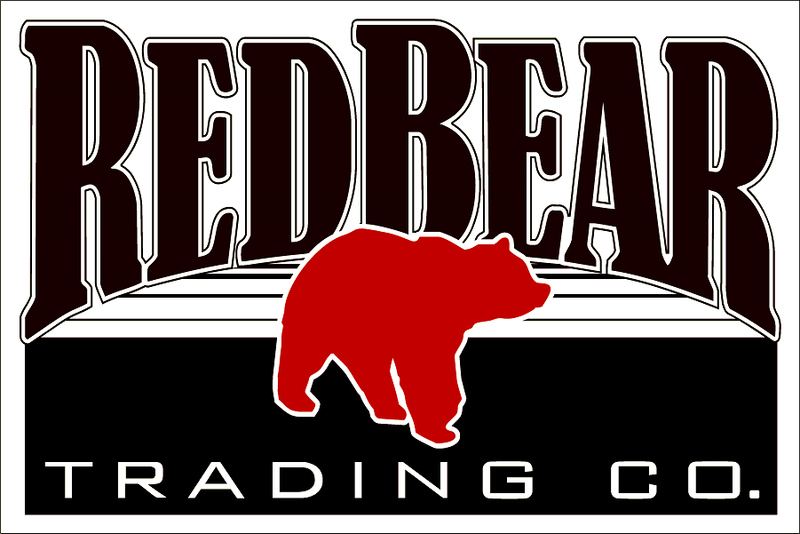 Consistently good and evocative – for sure!" Memory’, the latest offering ‘Shiny Silvery Things’ raises the bar yet again. As with previous recordings, this album holds a similar clutch of hook laden songs, superficial simplicity disguising thoughtful compositions, lyrically deep explorations and that all important personal touch that reflects O Caoimh’s music. ‘Shiny Silvery Things’ comes with more polish and comprehensive production - still reflecting the essential intimacy that personifies the man’s songs. The keen observation of ‘Second Hand Clothes’, the powerful attraction of ‘Proud’ and ‘Hey You’ with its quiet reflection, the statement that is ‘In The Hollow Of An Old Oak’ and the frank honesty of ‘Tea in my teacup’ all convey the essence of the man’s songs ... varied, finely painted and ever-widening illustrations. Cormac O Caimh, "Shiny Silvery Things" (Self released)-This Cork singer-songwriter's previous musical exploits have prompted highly favourable comparisons with the likes of Lloyd Cole and Prefab Sprout's Paddy McAloon, and "Shiny Silvery Things" mines the same rich vein of indie inspired melodicism which always makes his work so richly rewarding. Selecting highlights would be a pointless exercise because every track really is a subtly crafted gem." So where would you start if you wanted to assign a label to Cormac O Caoimh? It’s so diverse you would need a bucketload of tags and then you’d spend hours agonising over which order to put them in. Life’s too short, so let’s just go for eclectic... either way, there are twelve beautifully-crafted songs here that are set like jewels in arrangements and stylings that transform them into, well, “Shiny Silvery Things”. .. every melody’s an earworm, the lyrics are poetic and thought-provoking (there’s even an Atlantis reference) and Aoife Regan’s vocals have more than a hint of Wendy Smith, but there’s also a Gaelic twist to the album that gives it a unique character. Sublime. `Second hand Clothes` introduces us to this release and it’s a really interesting slice of intelligent nostalgic pop that would not stand out of place on any of Prefab Sprout releases. A beating drum and twinkling piano keys opens up `Silence And Sound`, a song that really gets under your skin. Cormac`s vocals are almost softly spoken and are complimented with some interspersed violin strings. `Proud` is a real upbeat tune, very danceable, with lyrics about trying to persuade somebody to be pleased or satisfied with the narrator. I could see this one being a real crowd pleaser in a live setting. A more sedate reflection on a relationship that has drifted follows with `Hey You`, which benefits from the stripped down backing of just a piano, bass and guitar. `Born` is a very haunting tune which is mostly Cormac`s voice spread over piano keys and violin before it is supported by a full band compliment to reach a crescendo. The next tune `Have You Built Yourself Well` reminded me of the best sophisticated pop numbers that the wonderful Deacon Blue used to write with Aoife Regan’s vocals the perfect foil to Cormac’s. `In The Hollow Of An Old Oak is a strange offering. It has an eerie presence and at times feels like a kind of mantra or chant. A sort of love song with the oddly titled `Tea In My Teacup` follows, which is a metaphor for supporting somebody during tough times. `Big Mirror` is another slice of pure pop and once again the use of Aoife Regan’s backing vocals to support O Caoimh is a master stroke. I really loved `A Parked Car` it was a wonderfully layered outing. It starts quietly with a beating drum, piano loops and Cormac`s descriptive words before John O’Connor’s saxophone saunters in. Midway through the band merge before the drums and sax lead us off and out of this piece. The penultimate number is the title track `Shiny Silver Things` a straight up jazz ditty. Quite unexpected. Closing out the album is `Lampshade Lights` a captivating serving of clever pop and a fine way to end this release. This was an interesting eclectic composition. A collection of fine songs. An assortment of stories and scenarios, thoughtful and idiosyncratic lyrics shared against a background of catchy pop music delivered by some very gifted musicians. Cormac O Caoimh has been bringing his unique brand of folk fusion to the world for a number of years now. His website shop is filled with a variety of albums and EPs that show off his immense musical ability but the latest is his justifiably critically acclaimed Shiny Silvery Things. It has been close to three years since Caoimh last released an album and it’s without a shadow of a doubt that this has been a long and arduous wait for his fans but when you take the time to sit down and listen to Shiny Silvery Things you will quickly understand why this album was worth the wait. This is an album that feels as natural as the flow of time and has clearly been allowed to progress and take shape over a long period of time. It is imbued with a deep and wondrous charm. This is largely due to Caoimh’s soft and charismatic voice. Gentle, subtle Irish tones flitter through his work and tug on your heartstrings. His voice is rich and smooth, incredibly warming and calming, even reflective. It has an element to it that is deeply familial and personal, giving you nothing but comfort. Accompanying Caoimh’s charming and playful vocals is of course a wildly vast collection of music that draws inspiration from a wealth of genres. You can hear melodies that echo gently with folk music, country, indie, pop and even jazz. It produces sounds that shadow everything from Borko to The Dissociatives. Shiny Silvery Things is a rich collection of songs that are softly uplifting and tentatively layered with a variety of instruments and sounds. There are rich organs that give the album traces of a gospel feeling but this is alongside swooping guitar medleys and light base lines that give his work a jubilant air. There are the smooth and sultry bursts of a saxophone that dips in and out and the result is a gloriously textured sound that allows you to listen time and again, finding a different hidden gem with each song. Shiny Silvery Things is a masterpiece that has been grown and nurtured to produce something that is unique and soulful. It is a warm and versatile album that can adapt itself to any mood. It’s without a doubt the finest work from Caoimh in years. Sometimes the softly sung lyrics are so intimate, revealing internal turmoil, that you feel like you are eavesdropping on a private conversation. At other times the words are oblique, hinting at some deeper truth you can’t quite grasp. ..
Cormac grows in songwriting ability with every album, and every album improves with each listen. If you haven’t yet checked out Start a Spark, A New Season for Love and The Moon Loses Its Memory, I recommend that you do." "There are echoes of terrific songwriters here – the likes of Lloyd Cole, Paul Simon, Eels’ Mark E Everett, and Prefab Sprout’s Paddy McAloon filter through – but O Caoimh’s personalized worldview makes the material his own"
Like the last album, there is undoubted warmth to O'Caoimh's sound and vocals on 'Second Hand Clothes', it also sounds richer in terms of production, and more wholesome, with the songwriter introducing more instrumentation, whilst also retaining that bare and honest feel. Something which O'Caoimh is most adept at is bringing a comforting smile to the face of the listener, but at the same time, tempering that with a subtle moroseness, almost pointedly delivered in the song's very final seconds. Cormac O Caoimh, dat moet je geen drie keer snel achter elkaar uitspreken. Wat we je wel zeker aanraden is om liedje Second Hand Clothes op repeat the zetten. Niet typisch Iers (zoals de naam doet vermoeden), maar gewoon een mooi popliedje in de traditie van The Go Between en Prefab Sprout. De nieuwste plaat, Shiny Silvery Things, verschijnt eind april. Wat vonden wij het midden van de jaren tachtig een geweldige tijd om muzikaal te beleven! Met volle teugen laafden we ons indertijd aan nieuwe platen van onder meer Morrissey en z’n Smiths, Lloyd Cole & The Commotions en Elvis Costello, om zomaar voor de vuist weg enkele van onze muzikale helden uit die periode te noemen. En dan waren er natuurlijk ook nog de opkomende talenten Roddy Frame, Paddy McAloon en Martin Stephenson. Met respectievelijk Aztec Camera, Prefab Sprout en de Daintees bezorgden zij ons zo menig een fijn moment. “High Land, Hard Rain”, “Swoon”, “Steve McQueen” en “Boat To Bolivia”, het zijn vier albums die voor eeuwig en altijd in ons geheugen gegrift staan. 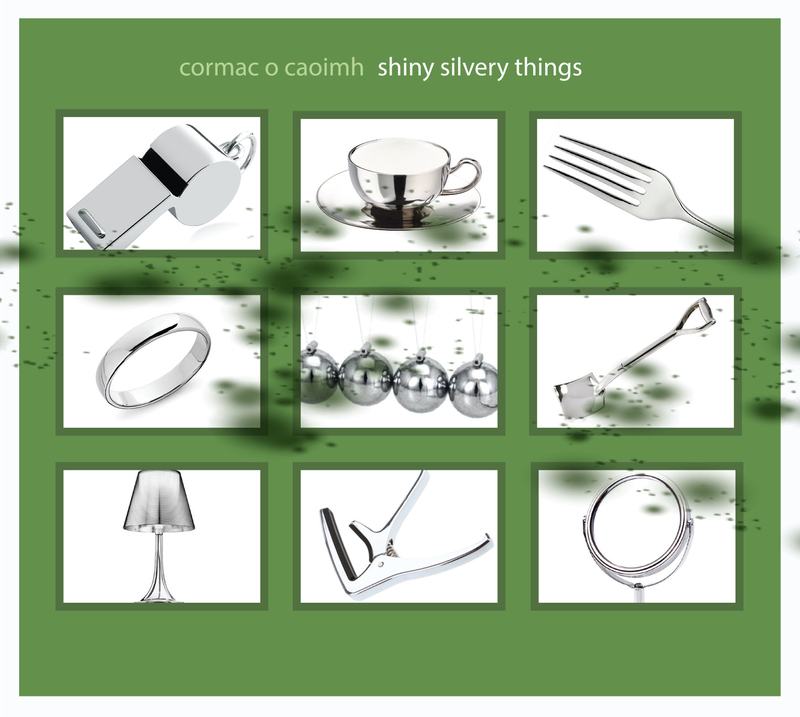 En precies in die traditie past ook “Shiny Silvery Things” van de vanuit Cork actieve Cormac O Caoimh. Als hij met “Second Hand Clothes” dat vierde album van ‘m op gang trapt, dan lijkt het wel alsof we met de teletijdmachine van professor Barabas uit de stripserie “Suske en Wiske” worden teruggecatapulteerd naar 1984 en het debuut van Paddy McAloon en de zijnen. Er is om te beginnen al een zekere stemgelijkenis tussen de twee, maar er is vooral ook hun gedeelde passie voor tot in de puntjes verzorgde popdeuntjes. Sommige traag, andere wat vlotter, sommige persoonlijk, andere net niet, sommige fictioneel, andere gebaseerd op de realiteit. Charmant van het eerste tot het laatste. Totaal niet opdringerig en zich paradoxaal genoeg toch ogenblikkelijk tussen de oren nestelend. Hartverwarmend mooi, niet zelden op het delicate af. Luister bijvoorbeeld maar eens naar dingen als het al genoemde “Second Hand Clothes”, “Have You Built Yourself Well”, “Hey You”, “Tea In My Teacup”, “Silence And Sound” en andere en tracht daarbij onbewogen te blijven. Het zal je niet meevallen! Bepaald niet. Mocht O Caoimh deze plaat zo’n dertig jaar eerder afgeleverd hebben, dan zouden we zijn naam nu allicht eerbiedig uitspreken in het hoger opgesomde lijstje met top-songwriters. Maar goed, dat is nu eenmaal niet het geval en dus zal hij genoegen moeten nemen met een plaatsje op de plank ergens heel dicht in de buurt van het prille materiaal van de heren McAloon, Frame, Stephenson en co. Een plaatsje waar het bijzonder goed toeven is. Gaan we alleszins nog heel veel plezier aan beleven, aan dit “Shiny Silvery Things”. Zoveel is nu al wel zeker. Hoe spreek je in hemelsnaam een familienaam als deze uit? Gelukkig is er bij de platenfirma iemand die er aan gedacht heeft dat even mee te geven op het promoblaadje dat bij deze CD zit: “O Kweeve”, zo spreek je dat dus uit. Ik zeg het maar even, omdat het best wel eens zou kunnen dat deze jonge kerel uit Cork binnen afzienbare tijd heel vaak op onze radiogolven te horen zal zijn en dan kunnen de DJ’s van dienst maar beter niet al te flagrant in de fout gaan…. Als ik een en ander goed heb opgezocht, is dit de vierde plaat van Cormac, een kerel die klassieke gitaar volgde in zijn nog jongere jaren en die de vaardigheden, die hij uit die opleiding meepikte, vandaag aanwendt om zijn kleine, fijne liedjes van klaterende begeleiding te voorzien. Deze plaat deed me nogal denken aan wat PaddyMcAloon destijds deed met Prefab Sprout of Roddy Frame met Aztec Camera: simpel klinkende, maar daarom niet minder geraffineerde popsongs schrijven en die heel eenvoudig opnemen. Die songs -de plaat bevat er een heus dozijn- zijn qua lengte allemaal van radiolengte en ze hebben stuk voor stuk het vermogen om zich ongevraagd vanaf de tweede of derde keer dat je ze hoort, onder je schedeldak te nestelen. Da’s eigen aan goeie popsong: hij kleeft aan je, hij dwingt je om hem nog eens en nog eens te beluisteren. Daarvoor is tegelijk veel en weinig nodig: als je een goeie pen hebt, heb je aan één beeld genoeg om het als metafoor te gebruiken voor de Grote Dingen van Het Leven. Dat doet Cormac dus zo’n dozijn keer op deze CD, waarmee ik maar één probleem heb: ik kan onmogelijk kiezen tussen de huppelende beat van “Proud”, de wat meer ingehouden ernst van “Silence and Sound” en de behoorlijk gesofisticeerde arrangementen en dito melodielijn van opener “Second Hand Clothes” en dan heb ik nog maar de eerste drie tracks van de plaat vermeld. De overige negen doen er nauwelijks of niet voor onder: “Hey You” drijft op een bezwerende piano en mijmert heel aangenaam over de fijne en minder leuke kanten van ouder worden en de onschuld van de jeugd verliezen. terwijl “Have You Built Yourself Well” een perfecte radiosingle zou zijn en “Tea In My Teacup” een op en top liefdeslied over kwetsbaarheid en jezelf geven is. De swing van de titelsong vind ik onweerstaanbaar mooi contrasteren met de wat bitterzoete ondertoon van de tekst en “Lampshade Lights” heeft zo’n mooi refrein…”Fade Out…I Close My Eyes and Draw You Now”…ik kan het niet helpen, maar ik vind dat mooi. Deze plaat heeft, zo denk ik toch, alles om veel mensen te bevallen: ik had het al over de knappe melodieën en fijne beeldspraak. Ik vermeldde al de stem, de zang en de gitaar van Cormac, maar net zo goed verdient de hele begeleidingsband, waar ik overigens niet één naam van kende, alle lof. Kijk, zoiets noem ik nu eens een prima kennismaking, zie! 'Silence and Sound' could be viewed as the bridge between his last album and shiny silvery things, O'Caoimh's trademark spin on spoken-word vocals which we heard in the past, now have a full-bodied instrumental accompaniment surrounding them with the net effect of creating greater vibrancy. On 'Hey You' the mood is more restrained, it could be interpreted as a call out to an old friend, or indeed a message to the self, reconnecting to what is important from within the chaos. 'Born' is a key highlight, the subtle and deliberate contradictions which litter the album continue; "you should have been born somewhere more or less pedestrian". Thematically it's akin to Leonard Cohen appearing on a Sgt. Peppers' bonus track, story-telling is in full flow here. The track bristles with charm and swings between old and new worlds with ease, throw in the (once again) inviting vocal harmonies and we have a definite high point on the album. Tack is changed slightly on the blues-infused 'Hollow of an Old Oak', mythical and pagan imagery abound; "build an Atlantis in my blood" the protagonist sings, beautiful. 'Big Mirror' uses the metaphor of the sea admiring the shore and the moon from it's own viewpoint, vis-à-vis our continuous outward look on life and others, instead of recognising our own positive traits and being comfortable in our skin. The album's title track opens with a bubbly country-rock intro, before veering into a jazz-club sound, with added electronic drum-pad giving it a jovial and swinging vibe. shiny silvery things closes with 'Lampshade Lights', a quirky minimalistic electronic intro catches your attention immediately, as the track progresses it wisps its way through soft-folk, ambient soundscapes and showcases O'Caoimh's ability to look at the seemingly inanimate and turn it into an epic storyboard. The final contradiction can be viewed as a whole once you've taken in the full 12 tracks on shiny silvery things, it is clear that Cormac O'Caoimh takes great care in structuring his songs and music, the mood of the story must relate to the sound of the music, the mark left on the listener must be reflected in the vocal delivery. The contradiction arises from the fact that although we are presented with seemingly careful structure, the overall feel is one of effortlessness on the songwriter's behalf, turning the everyday into the special, where we see the mundane to the point of not even noticing anymore, O'Caoimh sees shiny silvery things everywhere and breathes colourful life into every single one of them. "Cormac O Caoimh’s songs are elusively difficult to categorize. they have an engaging uncomplicated style to them that compliments his lyrical thoughtfulness. Sometimes he is deceptively simplistic other times he’s more wordy, introverted and introspective but with an uplifting message These are songs you can rummage around in and find something in the lyrics that speaks to you at your own point in time. Cormac’s words find an expressive symmetry in his electric and classical guitar playing"
È difficile introdurre un personaggio come Cormac O Caoimh avvalendosi del termine cantautore. L'esuberanza delle sue canzoni è infatti ben lontana dalla malinconia di molti autori country-folk; il suo stile è molto più vicino all'eleganza di Paddy McAloon o alla policromia lirica di Paul Simon. "In short, for the lover of better songs"
"Cormac O Caoimh is een Ierse liedjesschrijver en zanger uit Cork die zijn intelligente liedjes verpakt als popsongs. Het klinkt op het eerste gehoor allemaal heel bescheiden en redelijk ingetogen, maar als je beter luistert hoor je al snel dat de man intelligente en verrassende teksten aflevert en dat hij zijn liedjes ook verrassend in elkaar weet te steken, met af en toe een spannend uitgesteld refrein, subtiele details in de arrangementen, en dat allemaal op een ontspannen manier gebracht, terwijl het toch altijd spannend blijft. De liedjes blijven bovendien op een plezierige manier hangen, waardoor je ook steeds weer naar deze cd terugkeert, om nog maar een keer te luisteren, en dan blijken de arrangementen nog net even rijker dan je eerst al vermoedde. Mooi plaatje, kortom, voor de liefhebber van de betere liedjes"
"This Irish singer songwriter from Cork has a contemporary easy listening style in his folk music. Often, that can be a turnoff for me, but when someone masters the style as what happens here, a really enjoyable listening experience can result. The music has a slight sense of mystery and airiness within that transcends the soft approach into something deeper. As much as I enjoy the crazier aspects of psyche folk or folk rock, it is great to have quiet contrasts to round out the musical palette. And this LP will be a great item for your balance." Cormac O Caoimh is a classically trained guitarist but on his fourth album he seems more interested in expanding his song craft than showing off his fingerpicking. Fortunately, he is also joined by Colum Petit on violin and Aoife Regan on backing vocals.The Cork-based artist has such a gentle, soft-pitched voice that an expanded sonic palette helps avoid things getting too mellow or soporific. The twelve songs are elegant and complex attempts to get a grasp on intangible truths. with impressionistic and poetic lyrics. He is at pains to point out that this is not a concept album but, nevertheless, there are recurring themes of aging and identity. For example, on the opening track - Second Hand Clothes - he muses that when you "Run out of child, all that's left is man". The responses to the passing of time range from pessimistic: "Time is like a curse" (Silence And Sound), to the fatalistic: "Time will tell" (Big Mirror) to the surrealistic: "Patience is too hard when time moves like a parked car" (A Parked Car). In these songs, there is little which is transparent or obvious. The implicit meanings are that even the shiniest of things can get tarnished and that life's mysteries are both challenging and confusing. Hiding In The Hollow Of An Old Oak is presented as one option although keeping Tea In My Teacup seems a more practical and civilised solution. Singer-songwriter Cormac O’Caoimh (hoe zou dat worden uitgesproken?) komt uit Cork, Ierland. ‘Shiny silvery things’ met zijn hoes vol van deze dingen (o.m. kerstballen, een metalen theekopje-met-schotel, een scheidsrechterfluit, een armband, een vork, een opmaakspiegel staan afgebeeld op zowel voorkant als achterkant van het digipack) is zijn vierde CD. Geafficheerd als folk, maar in werkelijkheid een aangenaam akoestisch popachtig werkstuk – met folkaccenten, dat wel. De instrumentatie is prachtig, O’Caoimh speelt gitaren en zingt, producer Cormac O’Connor doet bas, telecaster en keyboards en verder horen we drums, additionele elektrische gitaar, viool en (‘A packed car’ alleen) saxofoon. Alle 12 songs zijn van O’Caoimh, de glimmende zilverkleurige spullen komen in zijn liedjes terug (uiteraard de titeltrack, maar ook ‘Tea in my teacup’, ‘Big mirror’ en ‘Lampshade lights’ refereren eraan). Mijn favoriet is het heerlijk ingetogen ‘Born’: ‘You should have been born somewhere else, a town designed by a kind architect. You should have been born somewhere else, somewhere more and less pedestrian. You could have been born somewhere else You should have been born somewhere else, with blessings blossoming your fingertips, You should have been born somewhere else, where your grace would grace all who you met’. Aldus Cormac O’Caoimh. He is well known for his conceptual and artistic lyrics and the title track “Second Hand Clothes” is no exception to this. From the very first line we hear “Your soul’s second hand clothes. Worn through at the knees and elbows.” From this alone I found myself wondering who’s he talking about, what does he mean by this statement? An artist that can have you asking questions from the first line of their first track is none short of visionary. The album intertwines a variety of dynamics and tones throughout. We have the more upbeat tracks such as “Proud” which cleverly juxtaposes a positive musical background with the melancholic lyrics of “I wanted to make you proud but I don’t know how”. This leaves the listener confused about what they are listening to; this is not a bad thing. His music challenges us no less that the poetry of Coleridge or Wordsworth would. The collection of tracks on Shiny Silvery Things claims to not be a concept album. I disagree with this statement. I believe Cormac is not only good at challenging his listener, but beautifully relaying a narrative. It may not be in chronological order, but it no doubt implants an experience on the audience. “Corkman Cormac O Caoimh releases his fourth album, well produced and recorded in his native city, with a host of local musicians aiding and abetting. All twelve songs are originals, with O Caoimh taking the lead vocals, and Aoife Regan contributing backing vocals on all songs. "I find it at the same time not exactly easy to describe, indeed often curiously elusive, this despite the quirky style of his writing that seems to speak personally to you, involving and engaging your emotions on the spot. There's also something of a late-70s/early-80s indie/new-wave feel about Cormac's inspiration (The Cure? Robyn Hitchcock? Smiths? or maybe I'm being fanciful? ), and while he makes good capital out of deceptively uncomplicated musical settings (guitars, keyboards, drums, occasional violin or sax) there's little that stands out in profile to distract from Cormac's own performance or the lyrics, which I guess is all to the good in the end. The good thing is that the introspective nature of Cormac's lyrics does not exclude his listeners. (And should we also be reflecting that the disc itself is a shiny silvery thing?)" "Hailing from Cork, Ireland, excitingly talented singer-songwriter, Cormac O Caoimh, premieres ‘Silence and Sound’, which is due for release Sept 15th 2017. 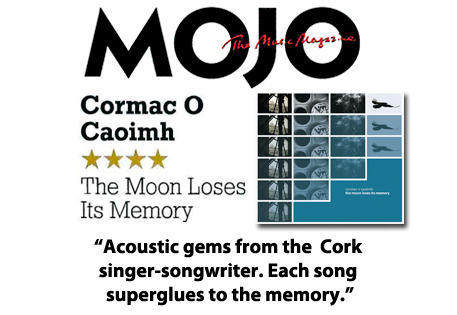 The track is a perfect example of his engagingly vivid sonic world, made of complex and yet highly accessible tunes, that gently intrigue and stimulate the listener…"
"New Music release by Cormac O’Caoimh, from Cork Ireland, the home of my Grandfather. The song, called “Silence and Sound” is an infectious soft Indie Pop Acoustic gem with poetic lyrics that express thoughts and moments in the shell of time. I’ve certainly had a few listens and give it a big thumbs up."